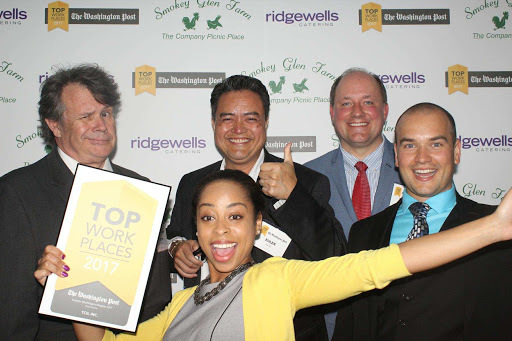 On June 15, TCG celebrated its third Top Workplace award from The Washington Post at a ceremony honoring the region’s best employers. TCG is ranked No. 26 in the region. This award is the result of an anonymous survey of employees conducted and analyzed by Workplace Dynamics to measure engagement, connection, effectiveness, and alignment of employees with the company. “TCGers give so much to the company and our customers — their skills, expertise, time. We try our best to give back as much as we can to our employees, to make sure they are taken care of, and to know that they are appreciated,” said Judith Turner, Vice President of Employee Happiness. TCGers have a bevy of hard and soft benefits, including telework and flexible working arrangements; transit, bike, and walking stipends for commuting; adoption assistance; pet insurance; sporting event and theatre tickets; and many more. In 2017, TCG was named on best workplace lists by Entrepreneur and Fortune, and also received an award from the District Department of Transportation for its telework program. TCG has six core values that govern how we treat one another, our customers, our partners, and our vendors. This has fostered a workplace culture of respect, openness, and supportiveness by colleagues and management which is made evident by the Washington Post Top Workplace award. TCG also has a pet snake named Monty that lives at headquarters.